What is the advantage of two-phase orthodontic treatment? Two-phase orthodontic treatment is a specialized process that combines tooth straightening and physical, facial changes. The purpose of two-phase treatment is to maximize the opportunity to accomplish the ideal healthy, functional, and aesthetic result that will remain stable throughout your child's life. What if treatment is put off? Putting off treatment can result in a need for more invasive treatment later in life that may not completely fix your child's smile. Early treatment is most effective for achieving lasting results. The goal of Phase One treatment is to help the jaw develop in a way that will accommodate all of the permanent teeth and improve the way the upper and lower jaws fit together. Children often exhibit early signs of jaw problems as they grow and develop. An upper jaw that is growing too much or is too narrow can be recognized at an early age. If children over the age of six are found to have this jaw discrepancy, they are candidates for early orthodontic treatment. Also, if children around the age of eight have crowded front teeth, early treatment can prevent the need to extract permanent teeth later. Children benefit tremendously from early-phase treatment. Receiving early treatment may prevent the removal of permanent teeth later in life, or the need for surgical procedures to realign the jaws. Orthodontic records will be necessary to determine the type of appliances to be used, the duration of treatment time, and the frequency of visits. Records consist of models of the teeth, X-rays, and photographs. During your child's initial consultation, the doctor will take records to determine if early treatment is necessary. In this phase, the remaining permanent teeth are left alone as they erupt. Retaining devices may not be recommended if they would interfere with eruption. It is best to allow the existing permanent teeth some freedom of movement. A successful first phase will have created room for permanent teeth to find an eruption path. Otherwise, they may become impacted or severely displaced. At the end of the first phase of treatment, teeth are not in their final positions. This will be determined and accomplished in the second phase of treatment. Selective removal of certain primary (baby) teeth may be in the best interest of enhancing eruption during this resting phase. Therefore, periodic recall appointments for observation are necessary, usually on a six-month basis. The goal of the second phase is to make sure each tooth has an exact location in the mouth where it is in harmony with the lips, cheeks, tongue, and other teeth. When this equilibrium is established, the teeth will function together properly. Phase Two usually involves full upper and lower braces. At the beginning of the first phase, orthodontic records were made and a diagnosis and treatment plan was established. Certain types of appliances were used in the first phase to correct and realign the teeth and jaw. The second phase begins when all permanent teeth have erupted, and usually requires braces on all the teeth for an average of 24 months. 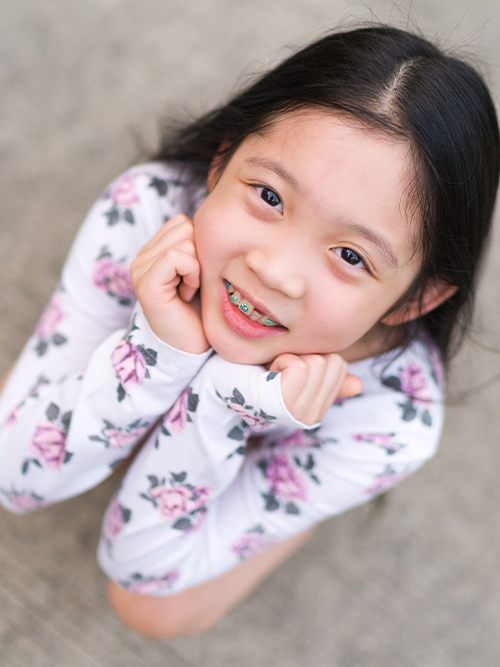 Retainers are worn after this phase to ensure your child retains his or her beautiful smile.